At the end of the winter semester, Boston University was on top of the world, or at least the region. 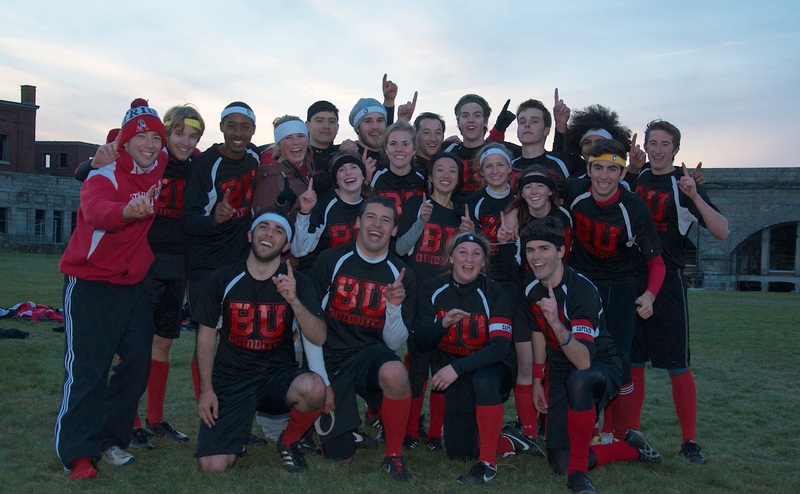 With back-to-back wins over Boston rivals Tufts University and Emerson College in the semifinals and finals of the Northeast Regional Championship, the Terriers earned their first tournament victory of the season and a reputation as a team to beat at the World Cup. To top it all off, co-captain beater Katrina Bossotti and keeper Brendan Stack were both named to the Eighth Man’s all-tournament first team. But with Bossotti and Stack both abroad for the spring semester, with only Bossotti returning for World Cup VI, it’s going to be up to the Terriers to make some major adjustments to remain amongst the game’s elite. Will they do what they need to to make a deep bracket run, or are they condemned to fall back to the pack? Key Players: Even with a semester’s worth of rust, no one will be more important to this team’s success come April than Katrina Bossotti. One of the game’s top female beaters, she’s capable of mixing a vast knowledge of the sport with a cannon of an arm. The result is an enormous radius for her beats, allowing her to remain in the center of the defense for longer than most beaters, even as play is extended to the flanks. She’s no slouch when it comes to retaining bludger control, adept at picking off retreating beaters and making vital catches, including a truly astouding one against Tufts in the regional semifinals. Bossotti does prefer to stay in her own zone with her team on offense, but her defense more than makes up for it. Boston University’s offense is built around the fast break, and no one on the team is better with the ball in his hands in that situation than co-captain Max Havlin. An apt defender with speed, he prefers to play the point, setting himself up for a quick outlet pass after a defensive stop that gets the ball moving quickly the other way. Havlin is always willing to make the extra pass, and has a great awareness of where his teammates are, usually without needing to waste a glance. His no-look passes are almost always on point, and are a major contributor to the Terriers’ reputation of having one of the game’s freest-flowing offenses. Players to Watch: With Stack off plying his trade in Europe, Boston University will turn to Michael Powell as their starting keeper. Powell has the height and leap necessary to serve as a safety in the Terriers’ defense, but his lanky form leaves questions about his effectiveness as a tackler. While he may not run the fast break quite in the way Stack is capable of, he has experience as a chaser, which may make him more dangerous on the attack than you might expect. John Blacker has long had a reputation as an elite seeker and snitch, owing largely to his height, arm span and experience, but it will be interesting to see how he handles the cup’s bigger, stronger snitches. He has help in the form of Tom Ford, who made the winning grab in the Northeast Regional final and brings a different skill set to the position. Strategy: The Terriers rely on their unwavering defense to both frustrate defenses and create for their offenses. They will start the game with a beater of each gender until they can get bludger control, at which point they will switch to a two female set and bury them deep in their defense. This gives them a defense good at protecting its control and that is large and athletic in man defense. Their point man will engage early in the play, while their other chasers will be all over the passing options. The keeper monitors the field, and also is apt at shutting down shot or pass attempts over the middle. Because of the power of Bossotti’s arm, their beaters can do damage without ever moving from their safe, central placement. The only way to breakthrough this defense is to get back bludger control, and it’s at that point that they will beat you on the counter. Their chasers are experts at taking off down the field the second they have a stop, and are always looking to pass. Few teams can run with them through a whole game, and the second an opponent loses a step, they will start scoring on every possession. If forced into a half-field offense, they will leave their beaters back, as well as their keeper, and attempt to break down a defense with passes that spread the coverage. They are far less efficient at scoring in this mode, but they do a good job of avoiding it at most times. Strengths: Boston University’s defense is one of the best in the sport, and even the best teams will have trouble breaking it down. The stamina and speed of their chasers is rarely matched on the pitch either, making it easy for them to pick up points in transition. Weaknesses: The Terriers’ snitch game, perhaps due to lack of need, is far from elite. With a beater setup that typically keeps them compressed on the defensive side, a switch to seeker beating doesn’t always work out well. Emerson seekers in the regional finals had ample one-on-one time with the snitch, and if that snitch hadn’t been as talented as Harry Greenhouse, we would likely have had a different result. Boston’s half-pitch and single-beater offenses are both anemic, and if the team can’t get and maintain bludger control, they will have trouble pulling away from teams even a tier below them, leaving them susceptible to a snitch-grab upset. Prediction: Boston University is too good at what they do to even be considered for elimination anything short of the Sweet 16. They undoubtedly have Final Four talent and athleticism, and could easily go that far, but there are too many questions with Stack, so I’ll predict an Elite Eight finish.